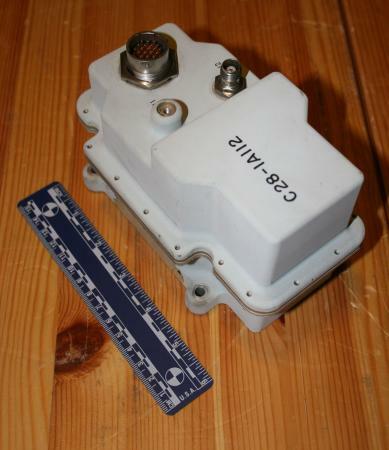 Very High Frequency (VHF) Recovery Beacon manufactured by Collins Radio (Cedar Rapids Iowa). The solid stage 1000 hz square wave tone-modulated AM transmitter was activated automatically upon deployment of the Command Module main parachutes, broadcasting a 243 Mhz carrier frequency transmitted for two second intervals interrupted by 3 seconds. The unit weights 2.7 pounds and is 4 x 4 x 6.75 inches, requires a maximum of 10 watts/28 volts DC. The emitted signal provided line-of-site direction finding for recovery forces.